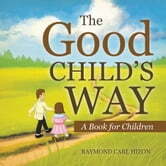 The Good Childs Way can serve as a guideline for young boys and girls who want to be good children. The book contains seven poems, each dealing with different aspects of a childs life. A core theme of the book is his relationships with other people, the world, and the Creator.